Did you know that about seventy percent of water in you home can be saved , if you consciously adapt ways to save it in your kitchen? Yes, that’s simply the truth. If you are a conscious home maker and want to adapt conscious ways of conserving water at home, and consequently in our planet, then do follow these simple tips. First and foremost, check out all taps or faucets in your kitchen, right from the one in the sink to the one that has been provided as an extra, to ensure that there is absolutely no leakage ,while it is not in use. Then, ask your plumber to reduce the water flow in the sink tap so that each time you open it to wash anything, be it vegetables, fruits, or even the cutlery and crockery, you do not waste much water. Yet another way of saving water in your kitchen is to use your dishwasher only when it is completely full. You can simply leave the used dishes and other items by rinsing it and placing it in the washer till it is full. You must also remember that while you take out any food item from the refrigerator , especially from the freezer compartment, you leave it to thaw at room temperature before using it, rather than taking it right under the sink faucet and washing it under running water. 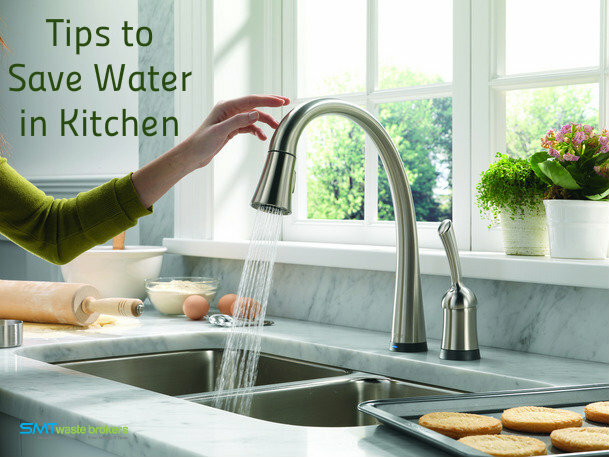 This way, a considerable amount of water in your kitchen will be saved. If you have the habit if washing your hands frequently while working in the kitchen, then simply take a tumbler of water and place it near the sink along with a mug in it. This way, you can take a little water with the mug and wash your hands each time you feel like. This way, you need not open the faucet of your kitchen sink thereby helping you save on quite a substantial amount of water in your kitchen. Act and work sensibly in the kitchen and save water on a daily basis!